(CNN) -- North Korea has made another move toward possibly restarting its suspended nuclear program, the U.N. nuclear agency reports. 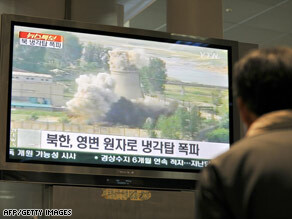 A South Korean looks at the demolition of a cooling tower at the North's Yongbyon nuclear complex, June 27, 2008. At the reclusive nation's request, the International Atomic Energy Agency has removed surveillance equipment and seals from the Yongbyon nuclear facility, agency spokeswoman Melissa Fleming said. The move clears the way for North Korea to reintroduce nuclear material to the facility. The North has told the IAEA that it will do that in a week or so. The U.N. nuclear watchdog will no longer have access at Yongbyon and will not be able to monitor any activities at the nuclear reprocessing facility. Mohamed ElBaradei, director-general of the International Atomic Energy Agency, said Monday that agency inspectors had observed that "some equipment previously removed by (North Korea) during the disablement process has been brought back." ElBaradei said then that he was hopeful that conditions could be developed for North Korea "to return to the Non-Proliferation Treaty at the earliest possible date and for the resumption by the agency of comprehensive safeguards." Last week, a South Korean news agency reported that North Korea was restoring a reactor at Yongbyon nuclear complex and no longer wanted to be removed from a U.S. list of countries that sponsor terrorism. Hyun Hak-Bong, a chief North Korean negotiator at the six-nation talks aimed at halting the country's nuclear program, told reporters his country was "thoroughly preparing to restart" the reactor and that reporters would "know soon" when his country would do that, the Yonhap news agency said. But a senior U.S. diplomat has said the announcement could simply be a bargaining ploy in the long-running negotiations. The U.S. had seen no indications North Korea was actually rebuilding its reactor, the diplomat said. The U.S. envoy to North Korea addressed the fresh standoff with reporters Monday, saying the U.S. was still trying to strike a deal with Pyongyang to come clean on its nuclear claims. "The six-party process has had its difficult moments and we are certainly experiencing one now," Assistant Secretary of State Chris Hill told reporters. Although North Korea has threatened to restart its nuclear reactor at Yongbyon, "We don't expect any dramatic developments in the next few days," he said. Hill said U.S. officials had the impression North Korea wanted to reach agreement with Bush administration before it left office. Earlier, a senior State Department official told CNN that in recent weeks the North Koreans had taken a "harder-line stance toward the six-party talks." U.S. intelligence officials told CNN last week that North Korean leader Kim Jong Il has been suffering serious health problems, and may have had a stroke. North Korea had agreed to disable the Yongbyon nuclear complex by October in exchange for a pledge from the U.S. to lift some sanctions and remove North Korea from a list of countries that sponsor terrorism.